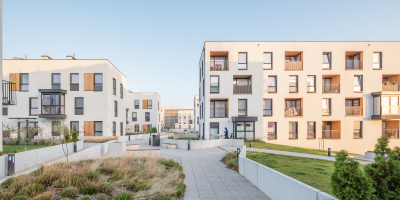 Searching for new typology in affordable housing. 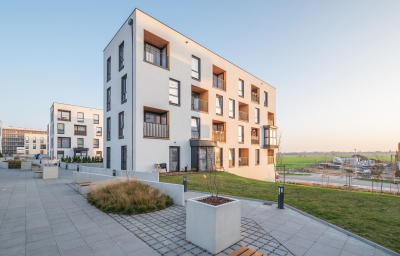 Small complex of affordable multi-family buildings placed on the plot K7 in Nowe Żerniki promotes creation of relationships within a neighborhood and try to reach the balance between a number of flats and density of buildings and public spaces. 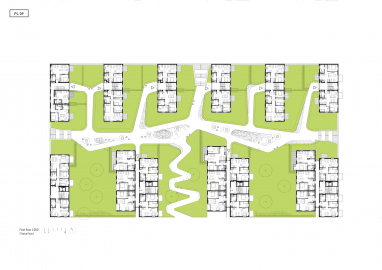 On the plot there are ten 3- and 4- storey blocks with the total 116 flats, placed upon green slope, slightly flowing down to the south and covering the lower level with garage and commercial premises. 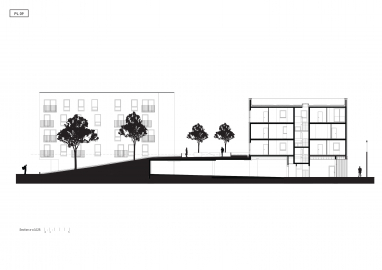 The size and structure of the buildings form a new typology – that despite high density enables to create small housing enclaves and provides the inhabitants a high-quality space, commonly associated with smaller dwellings. 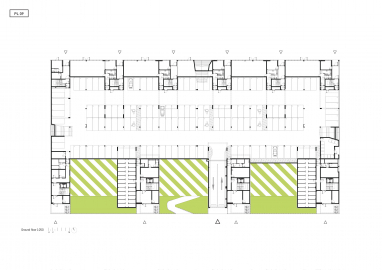 Public and semi-public spaces are placed in the courtyard above the basement level with the access for inhabitants not only from the surrounding buildings but all of the Nowe Żerniki estate. The ground floor by the northern buildings contains large gardens and there is green public space with trees in the passage. Because of social and economic profile of the estate, most of the flats are of 45-48m2 area and are easily modifiable to fulfill future requirements of users. Despite relatively small budget and realization limits the estate succeeded In creating cozy, comfortable and social space for all of inhabitants which was the initial idea of Nowe Żerniki as new model estate. 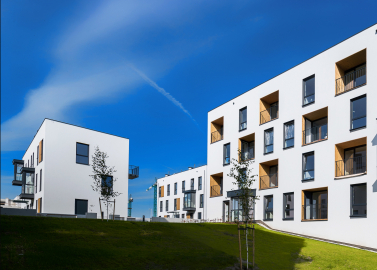 Multi-family housing building project was based on the concept design created during architectural workshops aiming to develop new model housing estate Nowe Żerniki. 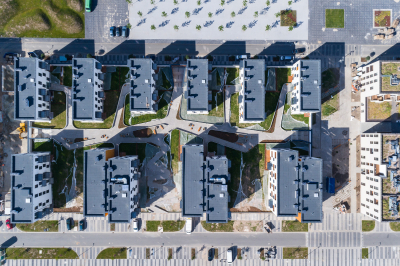 The New Żerniki estate is a project created by the City of Wrocław and Lower Silesian Chamber of Architects in collaboration with SARP Wroclaw. Estate designed by the best local architects should correspond to modern citizens needs, enhance forging social relationships, cope with sustainable architecture standards and finally become an architectural landmark of the city. 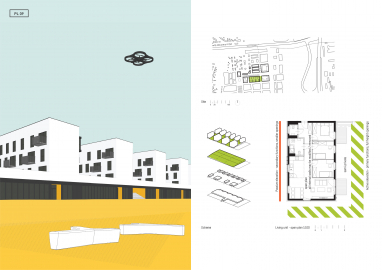 Over the 2-year workshops there were developed guidelines for the area – an estate masterplan (as a basis to the new Local Development Plan) and also detailed solutions for particular building lots, public spaces and objects. The main construction and installation system allows to adapt partition walls in the flats to the tenants' needs. Exceptionally large windows provide excellent lighting even in small apartments which appear more spacious. Exterior finishing materials were limited to white smooth roughcast, light timber boarding and prefabricated concrete objects in public spaces. Structure: reinforced concrete frame structure with filling walls. External finishes: fine-grained plasters, timber panels, precast reinforced concrete.